Artist drawings provided by police. A WOMAN WHOSE embalmed head was found in the western Pennsylvania woods more than a year ago may have died of a heart ailment, police said today. Tests run on the woman’s hair at the FBI Forensic Lab in Quantico, Virginia, showed traces of lidocaine and atropine — drugs used to treat acute heart ailments — in her system, Economy police Chief Michael O’Brien said at a news conference. 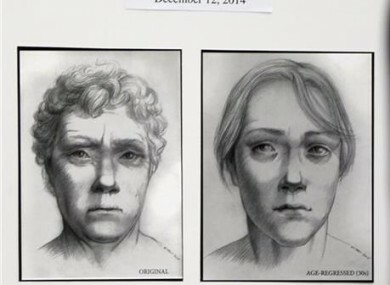 The woman’s head was found 12 December, 2014, by a boy walking through the woods in the borough about 15 miles northwest of Pittsburgh. But police have yet to determine who the woman is or why her head was severed from her body after it was embalmed. Authorities performed a burial service for the head at Beaver Cemetery on Saturday, the anniversary of the head’s discovery. They called a news conference today in hopes the publicity from the burial would help them disseminate the latest information on the case. “Her identity is a priority of this investigation,” O’Brien said. At the press conference he showed reporters a red rubber ball similar to those found in the place of eyes in the woman’s head. Beaver County Coroner told Channell 11 News that this is not common practice in the funeral business. O’Brien said that new isotope test results indicate that the woman may have lived the last seven months of her life in a region of the Allegheny Mountains from northern West Virginia stretching through western Maryland and Pennsylvania and into north central Pennsylvania. Beaver County District Attorney Anthony Berosh said a Salt Lake City company, IsoForensics Inc, was hired to test isotopes found in the woman’s body. Those substances are elements that form in human bodies due to the food and drink a person consumes, and can form combinations unique to certain geographic areas. Those tests suggest the woman moved several times in the months before she died, which means she might have been in the care of various family or friends, Berosh said. Email “Rubber balls found in eye-sockets of severed head in US”. Feedback on “Rubber balls found in eye-sockets of severed head in US”.